Home brewing with tea on the rise and tea single serve brewers is HOT! Hoteliers, small cafes and shops as well as retailers of whisk and spoon teas needed a custom single-serve solution. This new product meets the demand for a growing consumer market while providing a flexible option to fit multiple business models - with a royalty free single-serve format. This allows Whisk and Spoon customers greater control over quality, production, distribution and price. 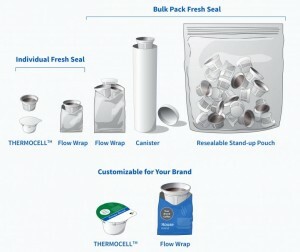 The filter is available as either refillable or single use compatible with Keurig® and other single-serve brewers. The 1 cup Solution is also a more eco-friendly single-serve option because the filter is made from 100 percent polypropylene, making it recyclable along with other #5 plastics. We are packaging these teas locally in Pennsylvania. Don’t miss the money-making possibilities of adding a new tea line to your beverage lineup. There's more to tea than good taste, the convenience of a single serve tea brewers in the home or office. A new source of revenue for your business since 2013. Tea has increased in popularity due to its many health benefits and lack of calories. ... However, the ubiquitous market presence leads to its convenience ... Interest in tea drinks is fueled by single-serve options available to consumers, who in turn are looking to purchase quality, good tasting tea blends for their brewers. Our packaging and fulfillment are all done in PA. By packaging our Single-Serve Teas in Pennsylvania we create local jobs for many businesses. Enjoy the Perfect Cup of Tea--while helping raise awareness and support for charities. More details.